What is the irritable bowel syndrome? What are the symptoms? Why does it occur? What are the treatments? Are there any tests that can definitely “prove” a person's symptoms are IBS-D? M. E. Money. M.D. 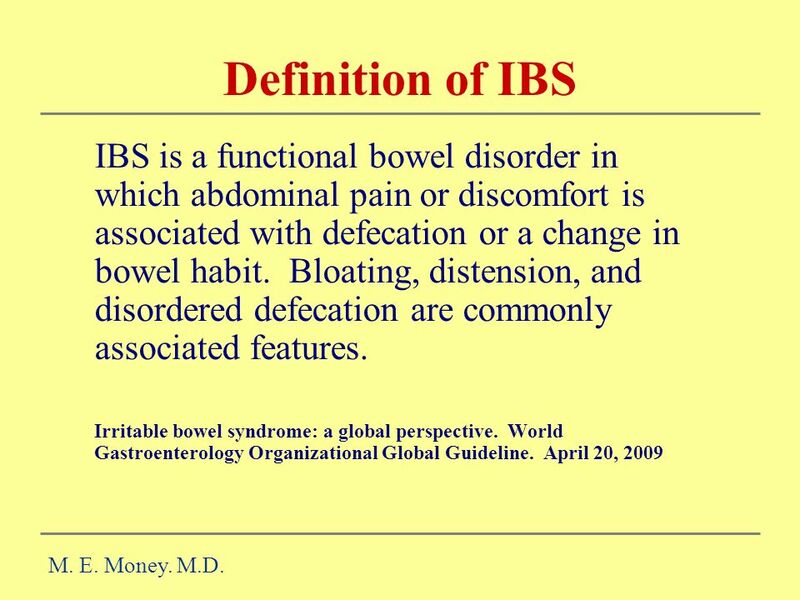 3 Definition of IBS IBS is a functional bowel disorder in which abdominal pain or discomfort is associated with defecation or a change in bowel habit. Bloating, distension, and disordered defecation are commonly associated features. Irritable bowel syndrome: a global perspective. World Gastroenterology Organizational Global Guideline. April 20, 2009 M. E. Money. M.D. 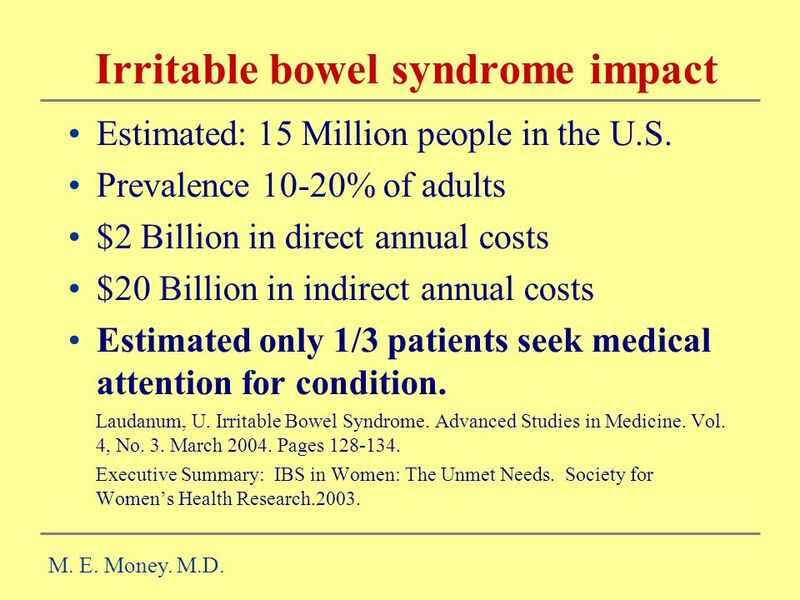 Exact cause of irritable bowel syndrome not known. Multiple factors thought to contribute to etiology. 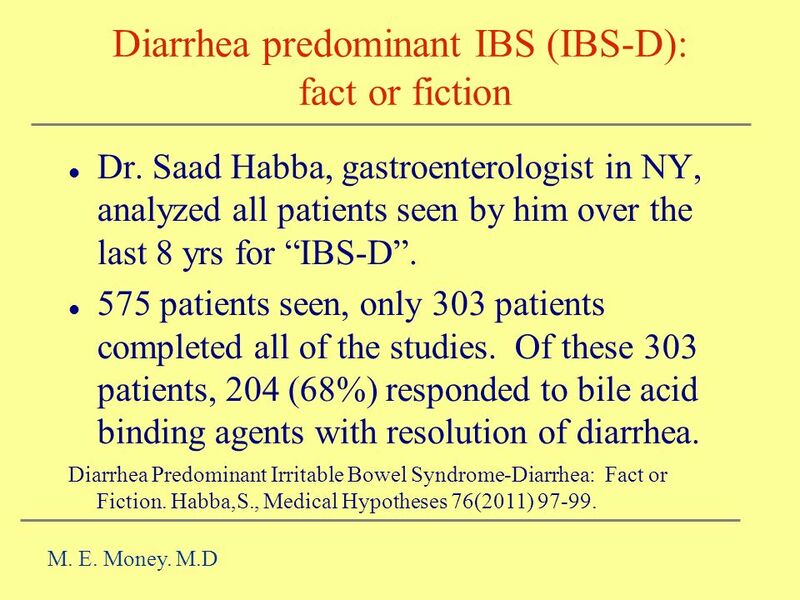 To date an 'IBS gene' has not been identified. 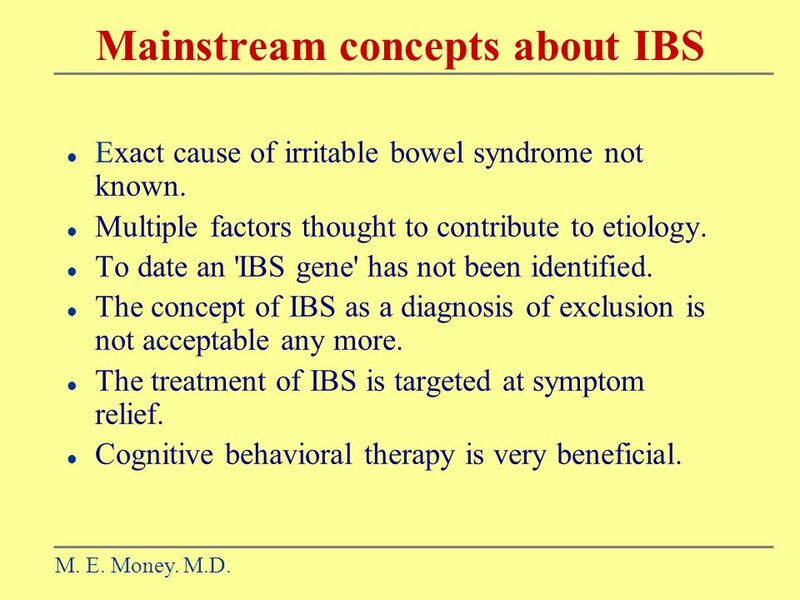 The concept of IBS as a diagnosis of exclusion is not acceptable any more. 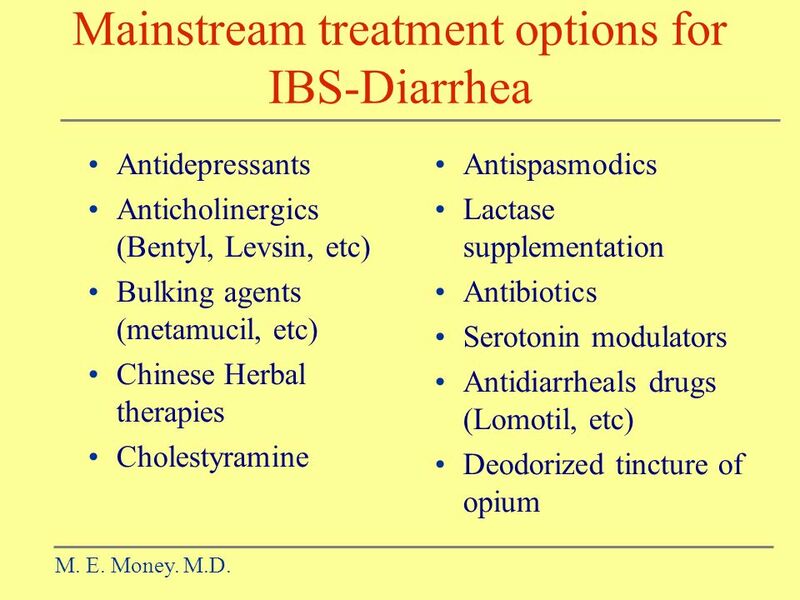 The treatment of IBS is targeted at symptom relief. Cognitive behavioral therapy is very beneficial. M. E. Money. M.D. Onset of symptoms at least 6 months before diagnosis Recurrent abdominal pain or discomfort for >3 days per month during the past 3 months At least two of the following features: Improvement with defecation Association with a change in frequency of stool Association with a change in stool form NB: What precedes the symptoms is not included. 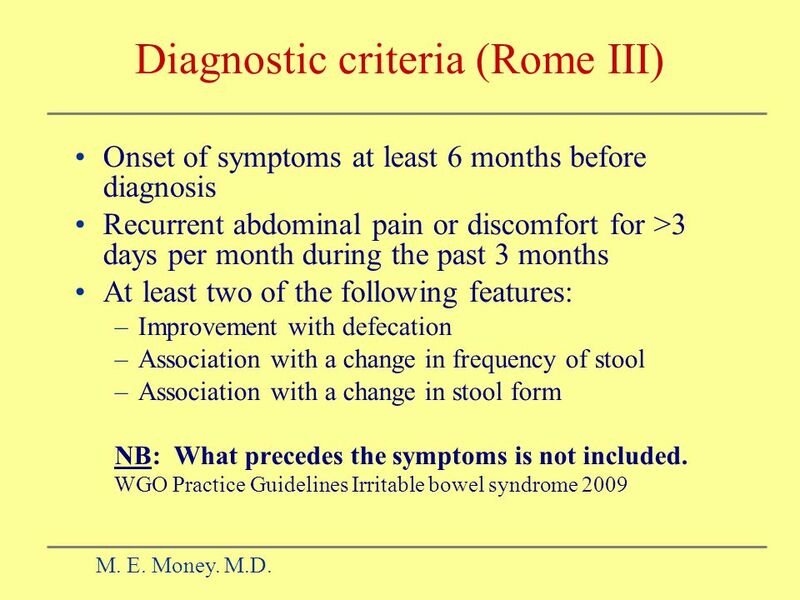 WGO Practice Guidelines Irritable bowel syndrome 2009 M. E. Money. M.D. Estimated: 15 Million people in the U.S. Prevalence 10-20% of adults $2 Billion in direct annual costs $20 Billion in indirect annual costs Estimated only 1/3 patients seek medical attention for condition. Laudanum, U. Irritable Bowel Syndrome. Advanced Studies in Medicine. Vol. 4, No. 3. March Pages Executive Summary: IBS in Women: The Unmet Needs. Society for Women’s Health Research.2003. M. E. Money. M.D. 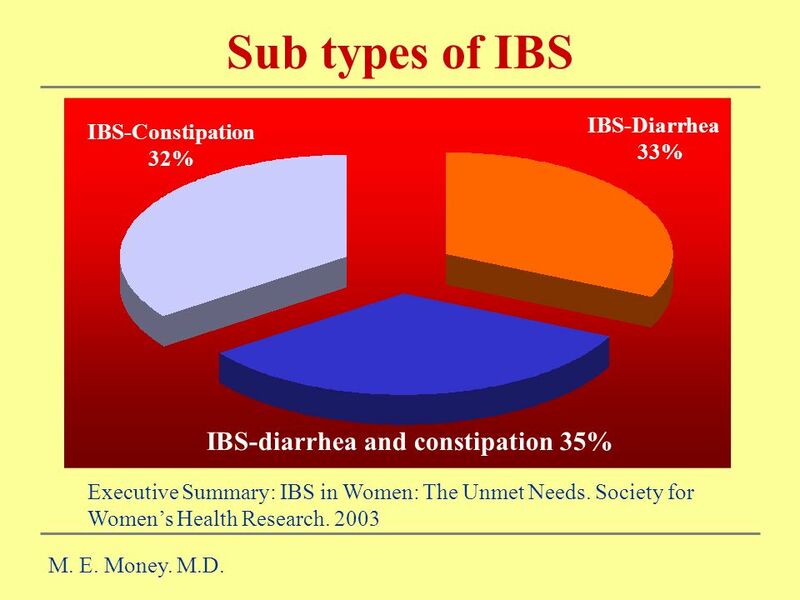 Sub types of IBS IBS-Diarrhea 33% IBS-Constipation 32% IBS-diarrhea and constipation 35% Executive Summary: IBS in Women: The Unmet Needs. Society for Women’s Health Research. 2003 M. E. Money. M.D. 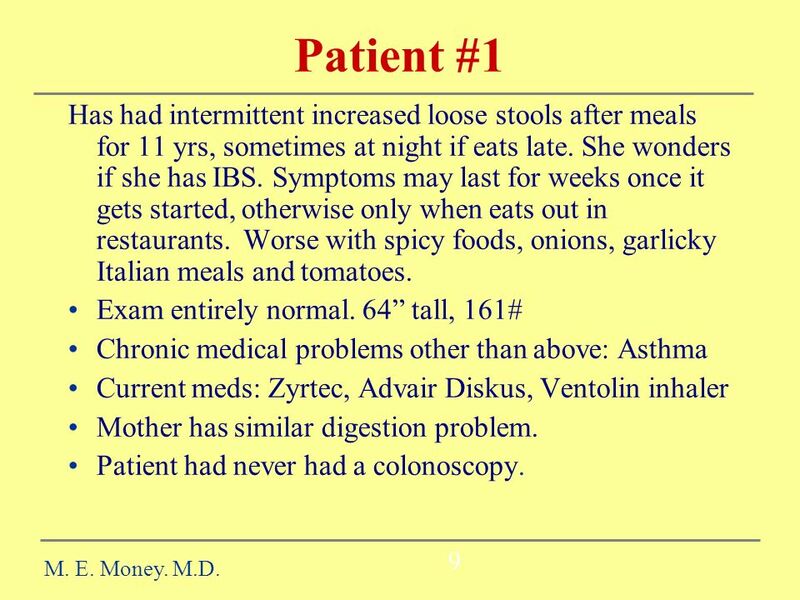 9 Patient #1 Has had intermittent increased loose stools after meals for 11 yrs, sometimes at night if eats late. She wonders if she has IBS. Symptoms may last for weeks once it gets started, otherwise only when eats out in restaurants. Worse with spicy foods, onions, garlicky Italian meals and tomatoes. Exam entirely normal. 64” tall, 161# Chronic medical problems other than above: Asthma Current meds: Zyrtec, Advair Diskus, Ventolin inhaler Mother has similar digestion problem. Patient had never had a colonoscopy. 9 M. E. Money. M.D. 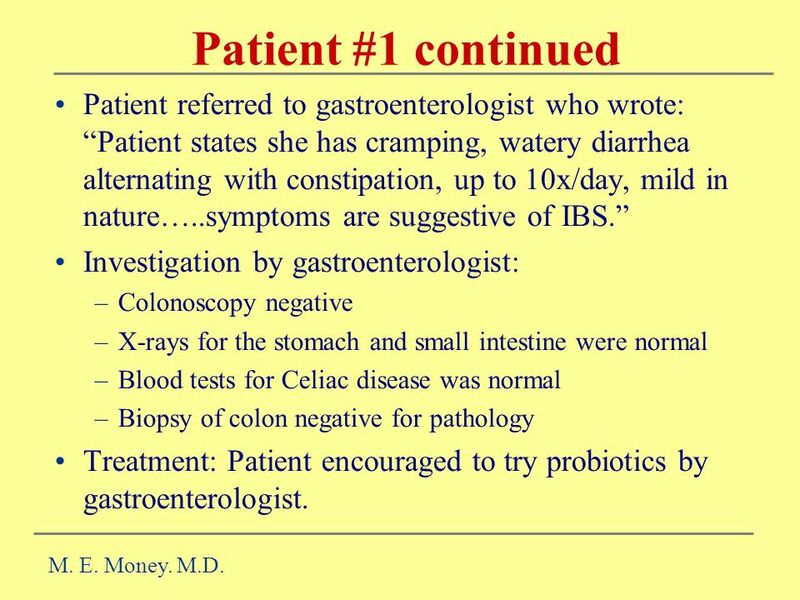 10 Patient #1 continued Patient referred to gastroenterologist who wrote: “Patient states she has cramping, watery diarrhea alternating with constipation, up to 10x/day, mild in nature…..symptoms are suggestive of IBS.” Investigation by gastroenterologist: Colonoscopy negative X-rays for the stomach and small intestine were normal Blood tests for Celiac disease was normal Biopsy of colon negative for pathology Treatment: Patient encouraged to try probiotics by gastroenterologist. M. E. Money. M.D. 11 Patient #2 11 year old male Father has trouble eating certain foods: gets abdominal pain and urgent diarrhea if eats out in restaurant and avoids onions at any time. Son observed to get extremely nervous and sweaty (clammy) when eating out in a restaurant. Would refuse to eat with the family sometimes. Didn't want to go with friends to parties. Frequently complained of having cramping stomach pains. M. E. Money. M.D. 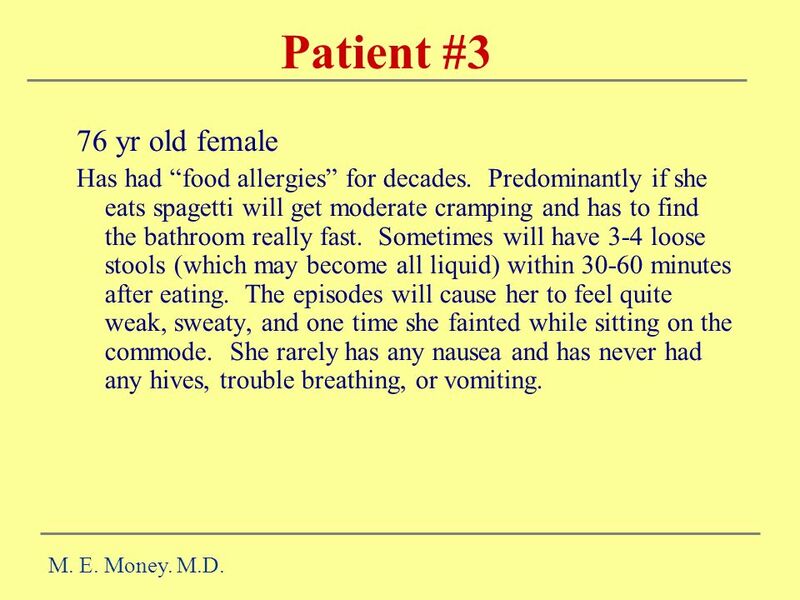 12 Patient #3 76 yr old female Has had “food allergies” for decades. Predominantly if she eats spagetti will get moderate cramping and has to find the bathroom really fast. Sometimes will have 3-4 loose stools (which may become all liquid) within minutes after eating. The episodes will cause her to feel quite weak, sweaty, and one time she fainted while sitting on the commode. She rarely has any nausea and has never had any hives, trouble breathing, or vomiting. M. E. Money. M.D. 13 Patient #4 55 year old construction worker. 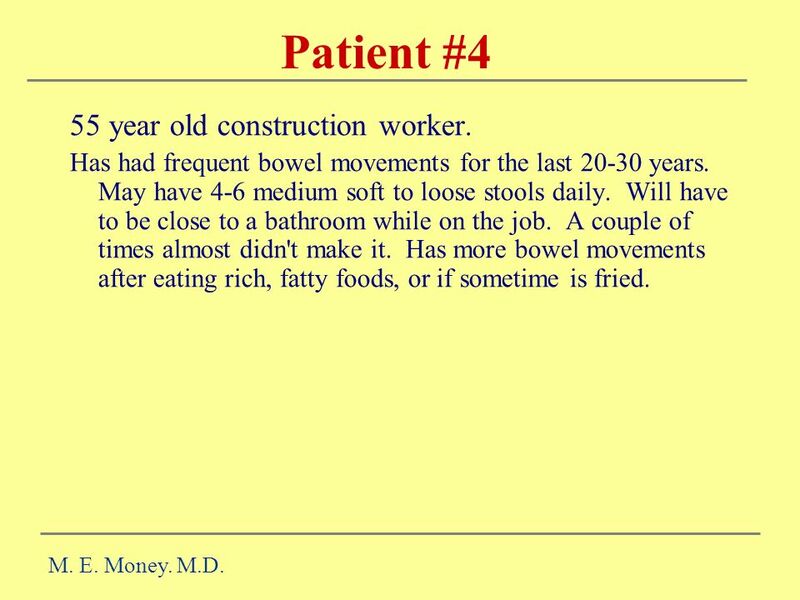 Has had frequent bowel movements for the last years. May have 4-6 medium soft to loose stools daily. Will have to be close to a bathroom while on the job. A couple of times almost didn't make it. Has more bowel movements after eating rich, fatty foods, or if sometime is fried. M. E. Money. M.D. 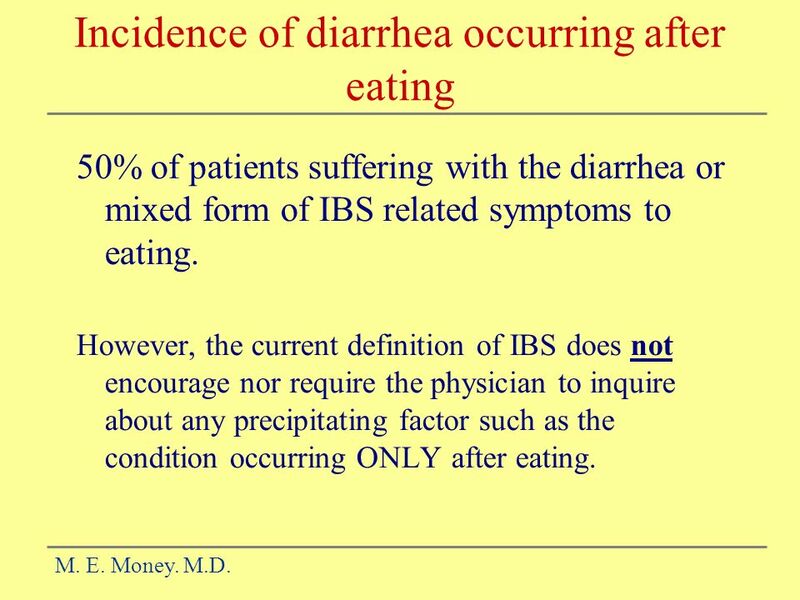 50% of patients suffering with the diarrhea or mixed form of IBS related symptoms to eating. 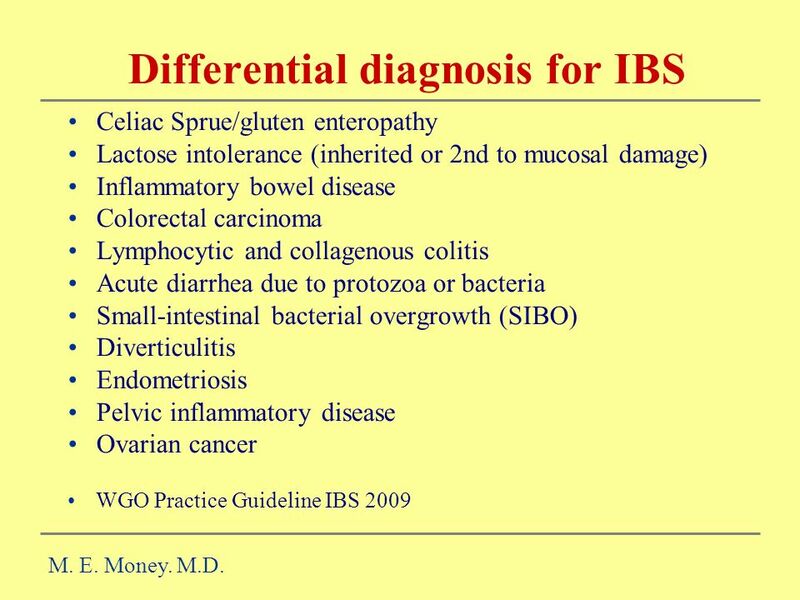 However, the current definition of IBS does not encourage nor require the physician to inquire about any precipitating factor such as the condition occurring ONLY after eating. M. E. Money. M.D. Celiac Sprue/gluten enteropathy Lactose intolerance (inherited or 2nd to mucosal damage) Inflammatory bowel disease Colorectal carcinoma Lymphocytic and collagenous colitis Acute diarrhea due to protozoa or bacteria Small-intestinal bacterial overgrowth (SIBO) Diverticulitis Endometriosis Pelvic inflammatory disease Ovarian cancer WGO Practice Guideline IBS 2009 M. E. Money. M.D. 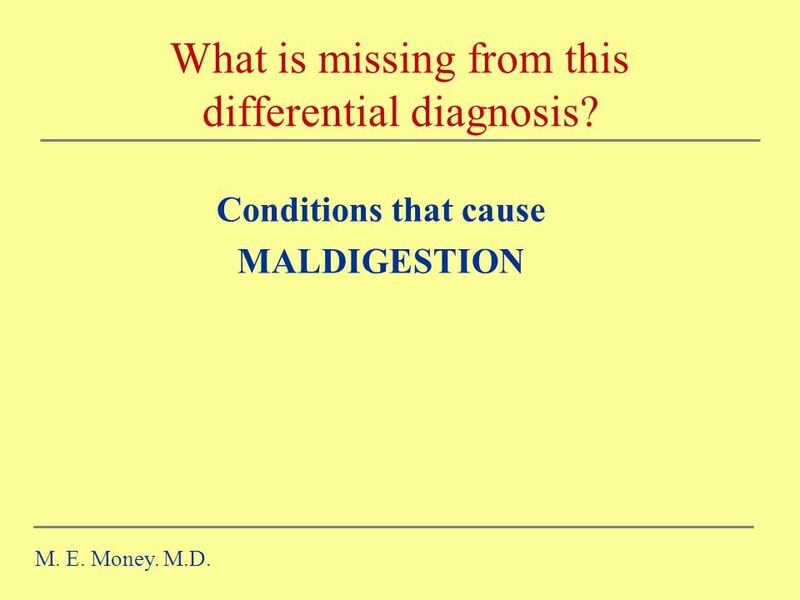 16 What is missing from this differential diagnosis? 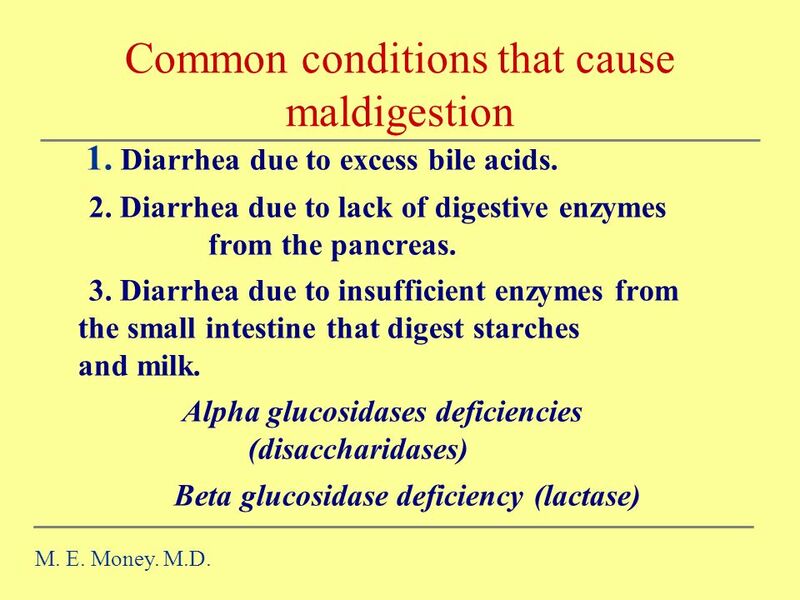 Conditions that cause MALDIGESTION M. E. Money. M.D. 1. Diarrhea due to excess bile acids. 2. 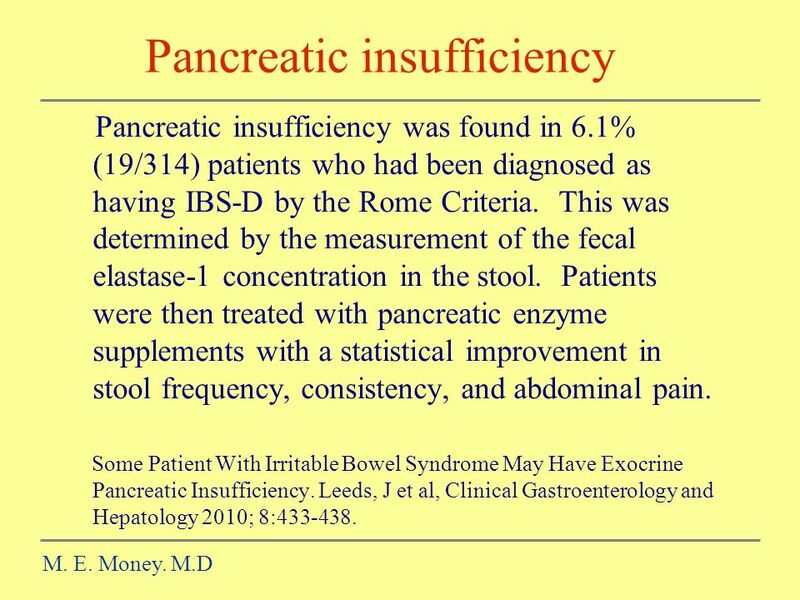 Diarrhea due to lack of digestive enzymes from the pancreas. 3. Diarrhea due to insufficient enzymes from the small intestine that digest starches and milk. 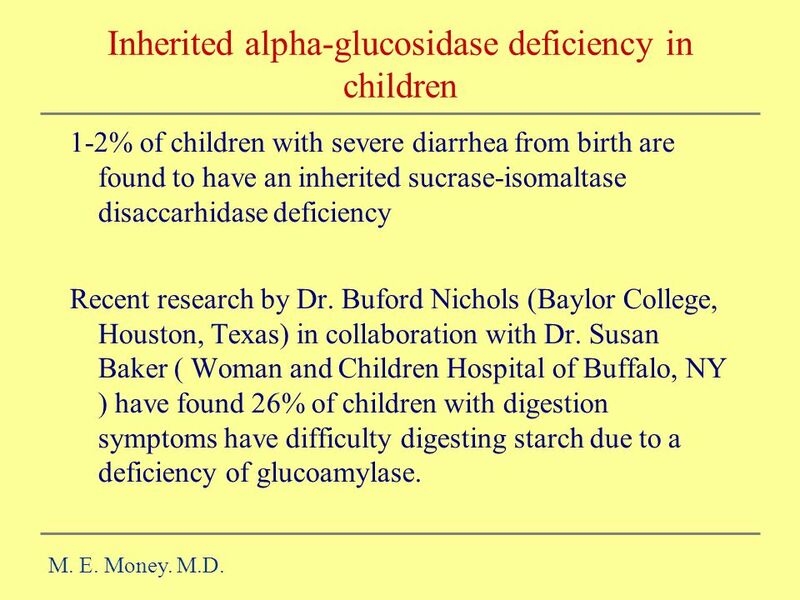 Alpha glucosidases deficiencies (disaccharidases) Beta glucosidase deficiency (lactase) M. E. Money. M.D. 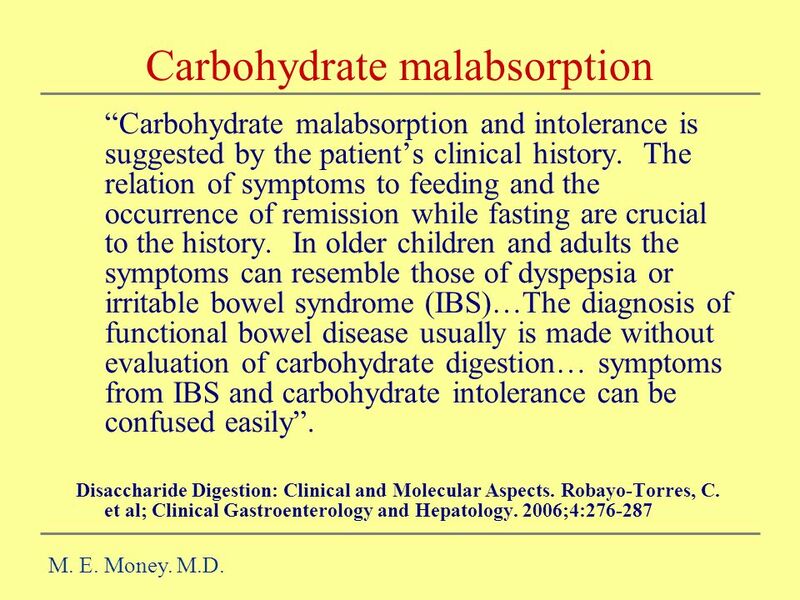 “Carbohydrate malabsorption and intolerance is suggested by the patient’s clinical history. The relation of symptoms to feeding and the occurrence of remission while fasting are crucial to the history. In older children and adults the symptoms can resemble those of dyspepsia or irritable bowel syndrome (IBS)…The diagnosis of functional bowel disease usually is made without evaluation of carbohydrate digestion… symptoms from IBS and carbohydrate intolerance can be confused easily”. Disaccharide Digestion: Clinical and Molecular Aspects. Robayo-Torres, C. et al; Clinical Gastroenterology and Hepatology. 2006;4: M. E. Money. M.D. 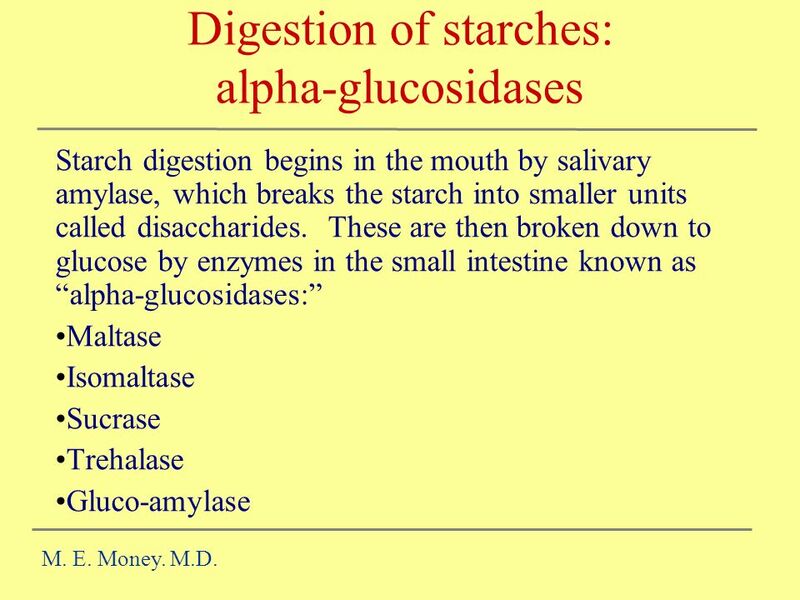 Starch digestion begins in the mouth by salivary amylase, which breaks the starch into smaller units called disaccharides. These are then broken down to glucose by enzymes in the small intestine known as “alpha-glucosidases:” Maltase Isomaltase Sucrase Trehalase Gluco-amylase M. E. Money. M.D. 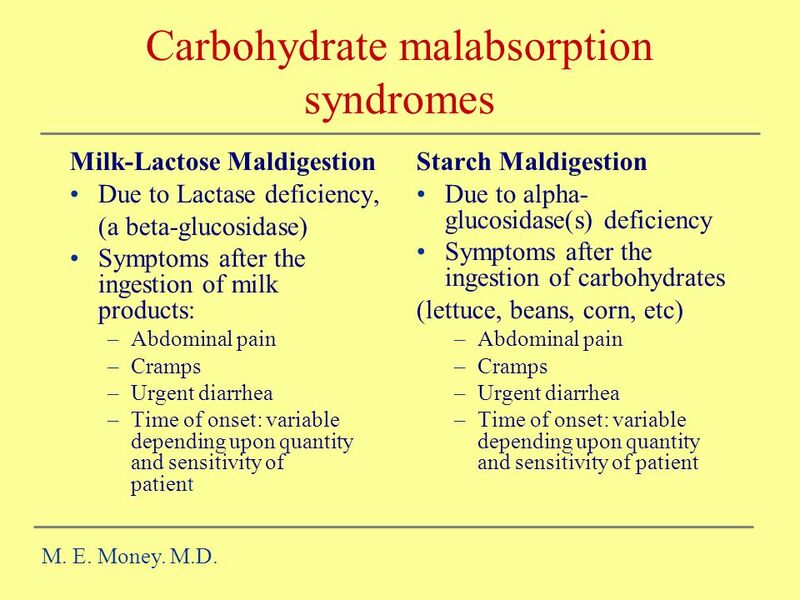 Milk-Lactose Maldigestion Due to Lactase deficiency, (a beta-glucosidase) Symptoms after the ingestion of milk products: Abdominal pain Cramps Urgent diarrhea Time of onset: variable depending upon quantity and sensitivity of patient Starch Maldigestion Due to alpha- glucosidase(s) deficiency Symptoms after the ingestion of carbohydrates (lettuce, beans, corn, etc) Abdominal pain Cramps Urgent diarrhea Time of onset: variable depending upon quantity and sensitivity of patient M. E. Money. M.D. 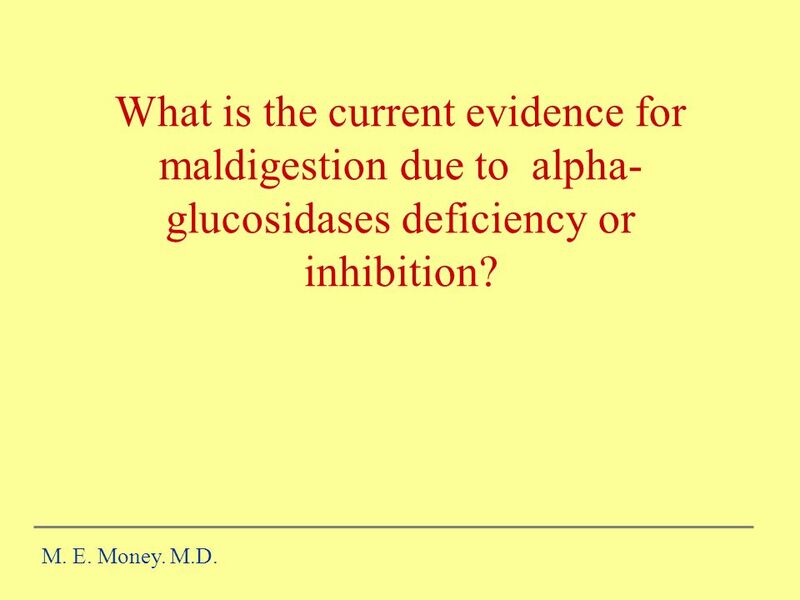 23 What is the current evidence for maldigestion due to alpha-glucosidases deficiency or inhibition? 1-2% of children with severe diarrhea from birth are found to have an inherited sucrase-isomaltase disaccarhidase deficiency Recent research by Dr. Buford Nichols (Baylor College, Houston, Texas) in collaboration with Dr. Susan Baker ( Woman and Children Hospital of Buffalo, NY ) have found 26% of children with digestion symptoms have difficulty digesting starch due to a deficiency of glucoamylase. M. E. Money. M.D. 4 papers from reported the identification of sucrase-isomaltase enzyme deficiency in adults. Symptoms were quite variable from none to constant diarrhea. Sonntag, W. M. et al, 1964, Gastroenterology 47:18. McNair, et al. 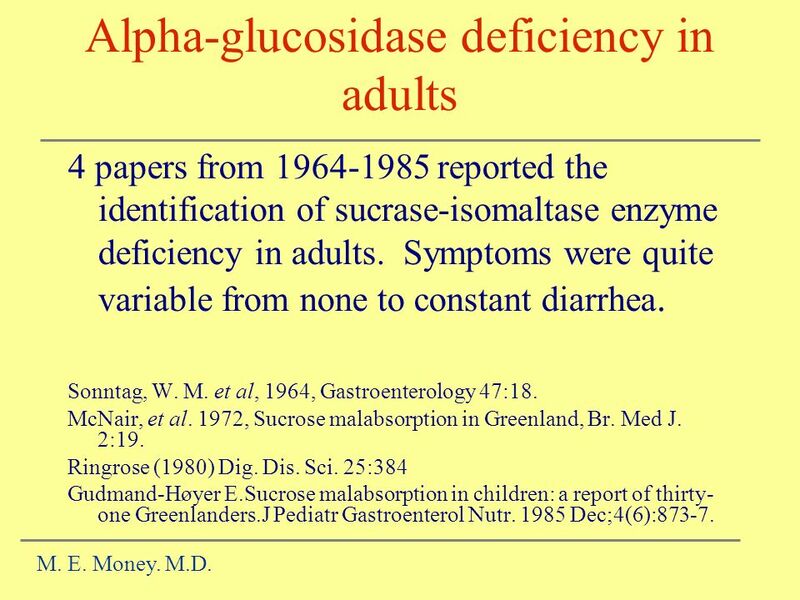 1972, Sucrose malabsorption in Greenland, Br. Med J. 2:19. Ringrose (1980) Dig. Dis. Sci. 25:384 Gudmand-Høyer E.Sucrose malabsorption in children: a report of thirty- one Greenlanders.J Pediatr Gastroenterol Nutr Dec;4(6):873-7. M. E. Money. M.D. 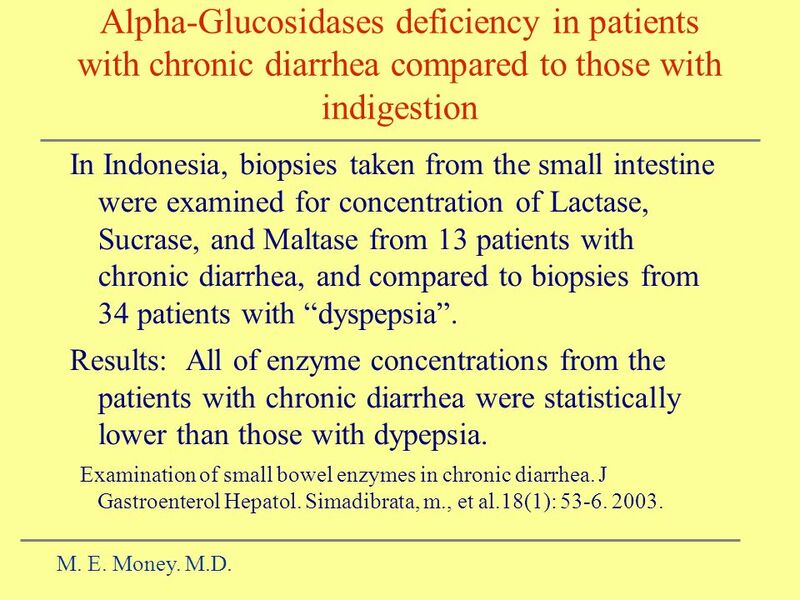 In Indonesia, biopsies taken from the small intestine were examined for concentration of Lactase, Sucrase, and Maltase from 13 patients with chronic diarrhea, and compared to biopsies from 34 patients with “dyspepsia”. Results: All of enzyme concentrations from the patients with chronic diarrhea were statistically lower than those with dypepsia. Examination of small bowel enzymes in chronic diarrhea. J Gastroenterol Hepatol. Simadibrata, m., et al.18(1): M. E. Money. M.D. 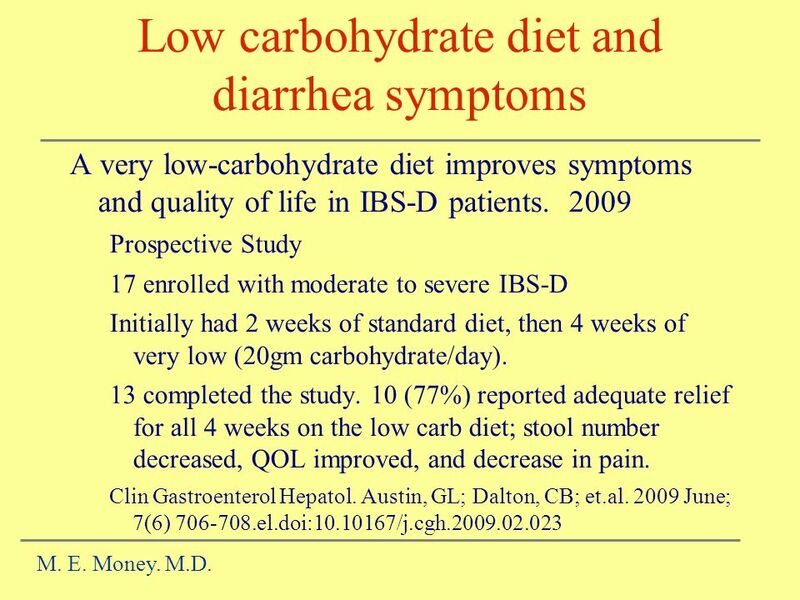 A very low-carbohydrate diet improves symptoms and quality of life in IBS-D patients Prospective Study 17 enrolled with moderate to severe IBS-D Initially had 2 weeks of standard diet, then 4 weeks of very low (20gm carbohydrate/day). 13 completed the study. 10 (77%) reported adequate relief for all 4 weeks on the low carb diet; stool number decreased, QOL improved, and decrease in pain. Clin Gastroenterol Hepatol. Austin, GL; Dalton, CB; et.al June; 7(6) el.doi: /j.cgh M. E. Money. M.D. 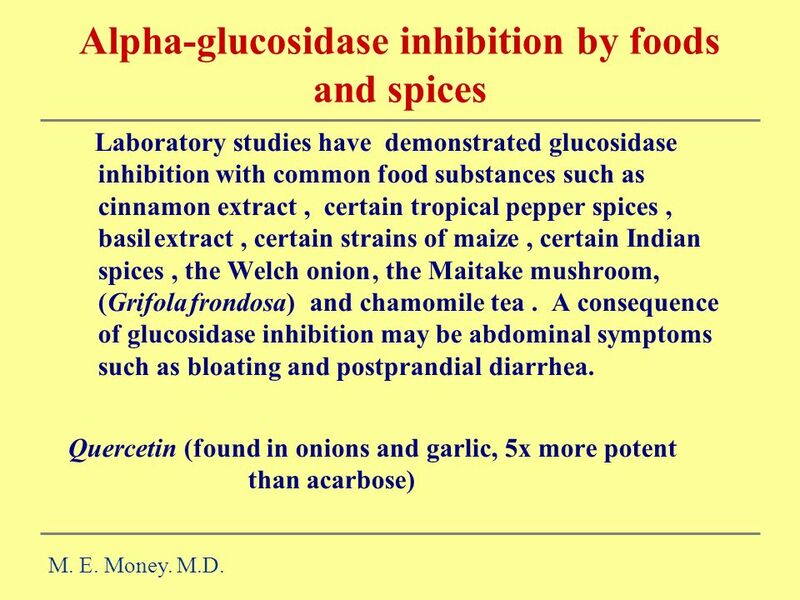 Laboratory studies have demonstrated glucosidase inhibition with common food substances such as cinnamon extract , certain tropical pepper spices , basil extract , certain strains of maize , certain Indian spices , the Welch onion , the Maitake mushroom, (Grifola frondosa) and chamomile tea . A consequence of glucosidase inhibition may be abdominal symptoms such as bloating and postprandial diarrhea. Quercetin (found in onions and garlic, 5x more potent than acarbose) M. E. Money. M.D. 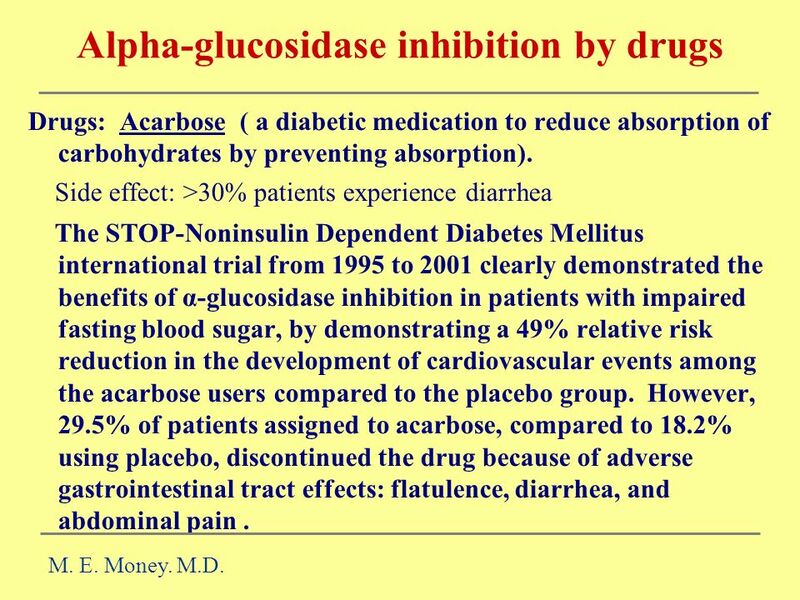 Drugs: Acarbose ( a diabetic medication to reduce absorption of carbohydrates by preventing absorption). Side effect: >30% patients experience diarrhea The STOP-Noninsulin Dependent Diabetes Mellitus international trial from 1995 to 2001 clearly demonstrated the benefits of α-glucosidase inhibition in patients with impaired fasting blood sugar, by demonstrating a 49% relative risk reduction in the development of cardiovascular events among the acarbose users compared to the placebo group. However, 29.5% of patients assigned to acarbose, compared to 18.2% using placebo, discontinued the drug because of adverse gastrointestinal tract effects: flatulence, diarrhea, and abdominal pain . M. E. Money. M.D. Antidepressants Anticholinergics (Bentyl, Levsin, etc) Bulking agents (metamucil, etc) Chinese Herbal therapies Cholestyramine Antispasmodics Lactase supplementation Antibiotics Serotonin modulators Antidiarrheals drugs (Lomotil, etc) Deodorized tincture of opium M. E. Money. M.D. Over the counter agents: Fiber capsules (which absorbs extra liquids) Calcium (which slows down the motility naturally), Enzyme supplement: Essential Enzymes 500 mg (by Source Natural), an over the counter supplement (1-3) before eating any “trigger meal” or daily as needed. 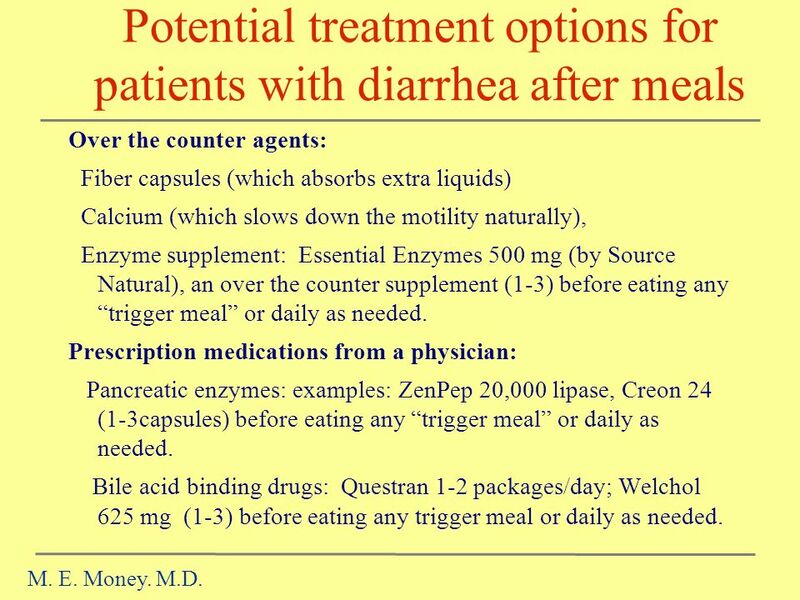 Prescription medications from a physician: Pancreatic enzymes: examples: ZenPep 20,000 lipase, Creon 24 (1-3capsules) before eating any “trigger meal” or daily as needed. Bile acid binding drugs: Questran 1-2 packages/day; Welchol 625 mg (1-3) before eating any trigger meal or daily as needed. M. E. Money. M.D. 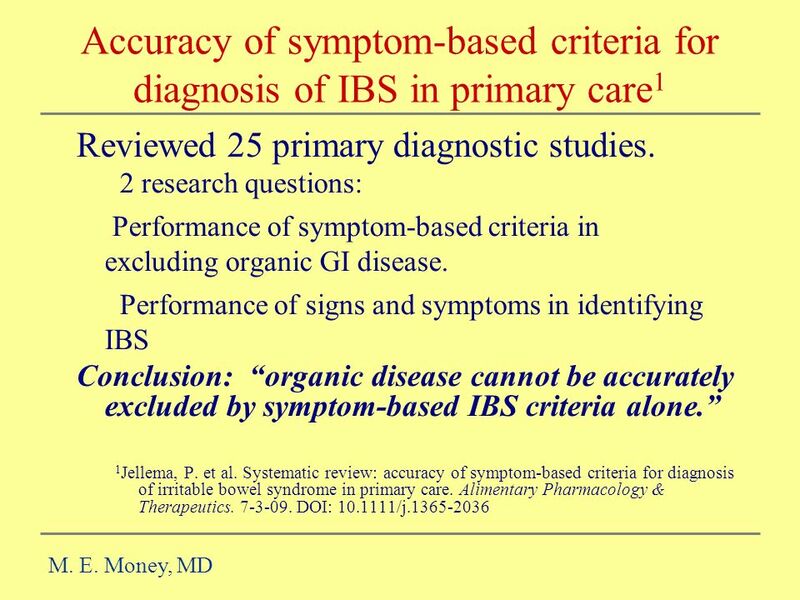 A retrospective review was recently completed of all of the patients in my practice who had the diagnosis of IBS and had been treated by me from to evaluate the effectiveness of the enzymes. 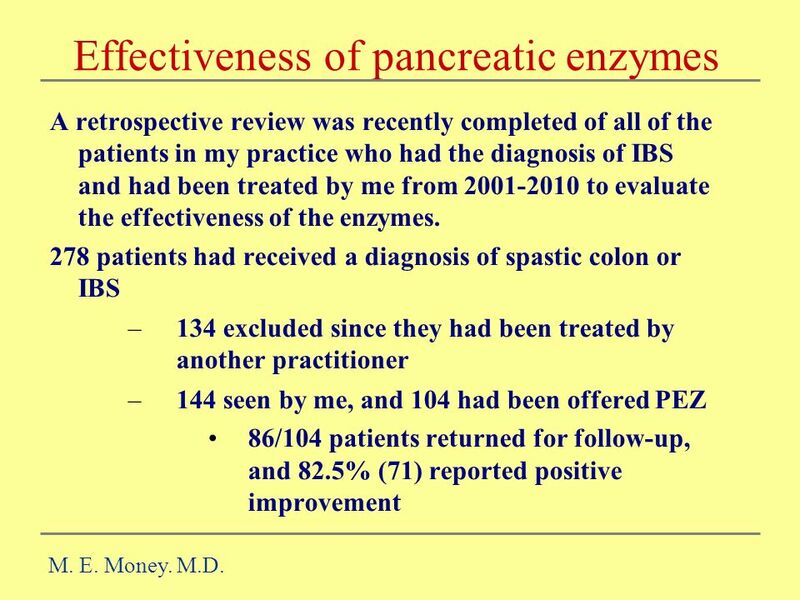 278 patients had received a diagnosis of spastic colon or IBS 134 excluded since they had been treated by another practitioner 144 seen by me, and 104 had been offered PEZ 86/104 patients returned for follow-up, and 82.5% (71) reported positive improvement M. E. Money. M.D. 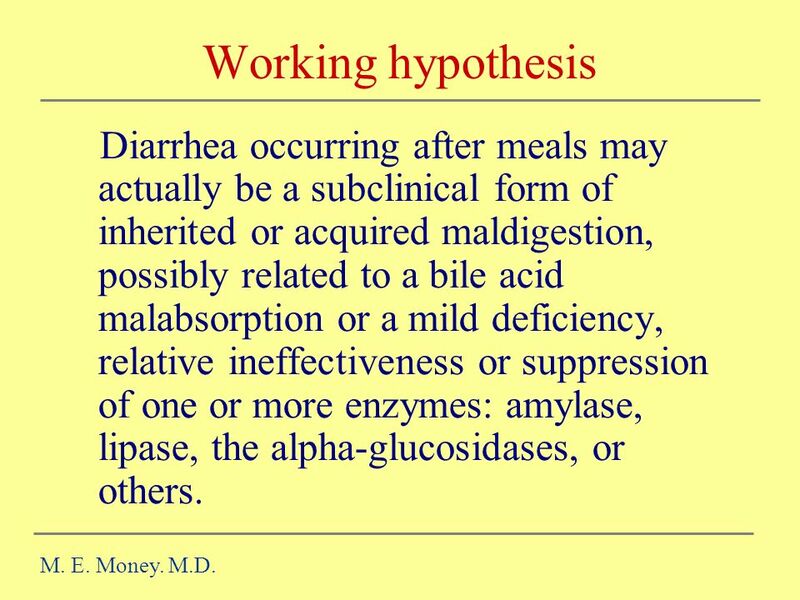 35 Working hypothesis Diarrhea occurring after meals may actually be a subclinical form of inherited or acquired maldigestion, possibly related to a bile acid malabsorption or a mild deficiency, relative ineffectiveness or suppression of one or more enzymes: amylase, lipase, the alpha-glucosidases, or others. M. E. Money. M.D. 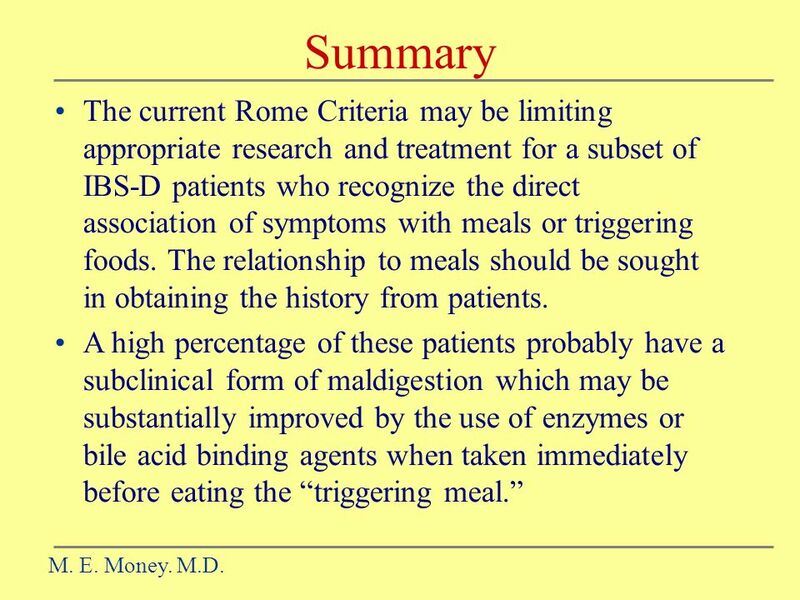 36 Summary The current Rome Criteria may be limiting appropriate research and treatment for a subset of IBS-D patients who recognize the direct association of symptoms with meals or triggering foods. The relationship to meals should be sought in obtaining the history from patients. 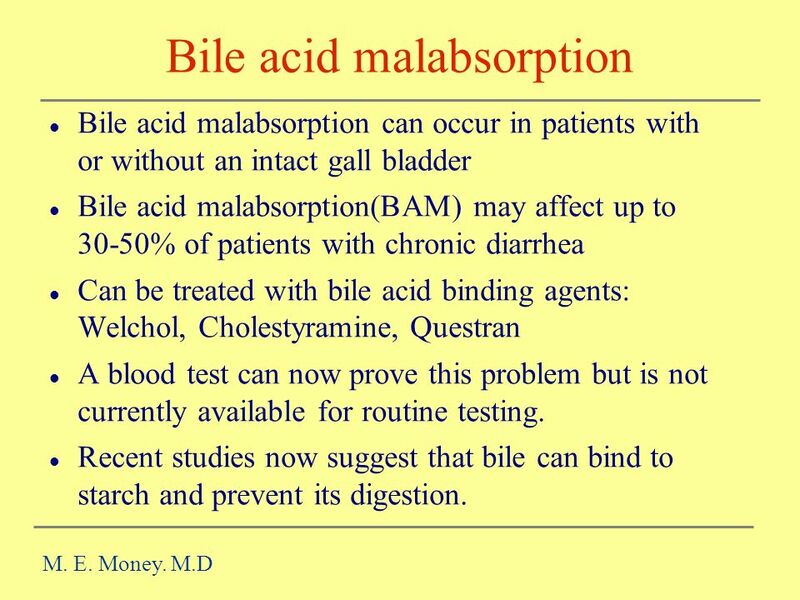 A high percentage of these patients probably have a subclinical form of maldigestion which may be substantially improved by the use of enzymes or bile acid binding agents when taken immediately before eating the “triggering meal.” M. E. Money. M.D. 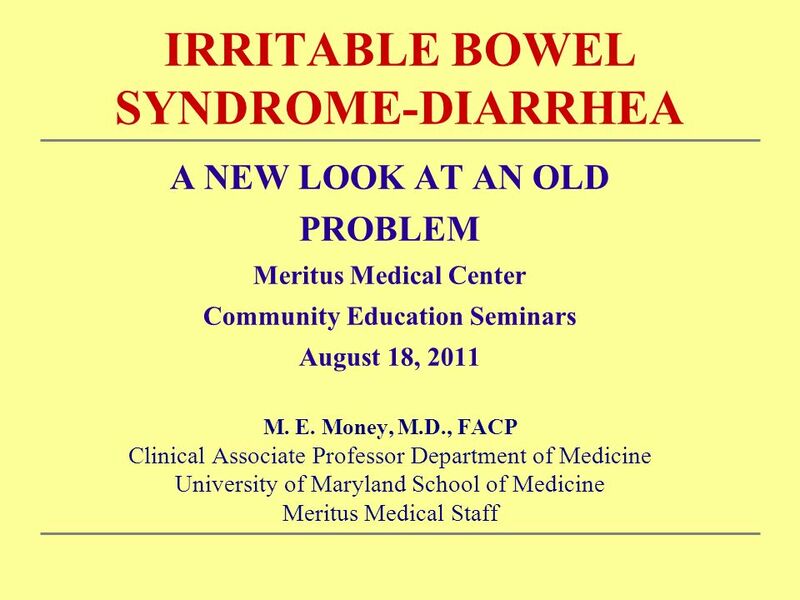 Download ppt "IRRITABLE BOWEL SYNDROME-DIARRHEA"
THE DIGESTIVE SYSTEM. Parotid gland Sublingual gland Submandibular gland Esophagus Stomach Liver Gallbladder Large intestine Small intestine Appendix. © 2007 Thomson - Wadsworth Chapter 18 Nutrition and Lower Gastrointestinal Disorders. 1 Chapter 8 Drugs for Gastrointestinal Disorders. It’s A Gut Feeling: Abdominal Pain in Children David Deutsch, MD Pediatric Gastroenterology Rockford Health Physicians. 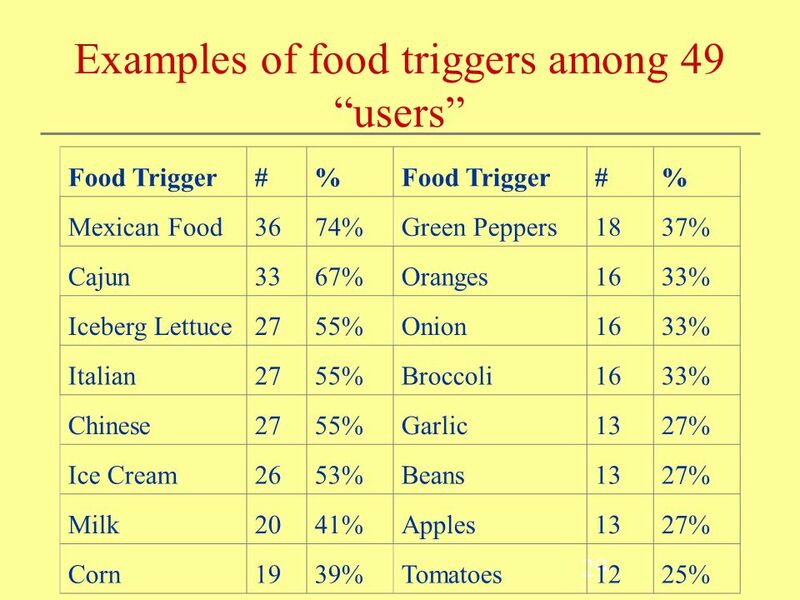 Two Key Functions: Digestion - breaking down food into smaller molecules (nutrients). Absorbing these nutrients into the bloodstream. Digestive and Lymphatic System By: Mackinsey and Melad. Lower GI Tract - Part One NFSC Clinical Nutrition McCafferty.  An autoimmune disease where the protein gluten damages the villi in the small intestine causing malabsorption.  Celiac Disease is a lifelong condition. INFECTIONS AND IRRITABLE BOWEL SYNDROME (IBS) By Pebbles Miller. 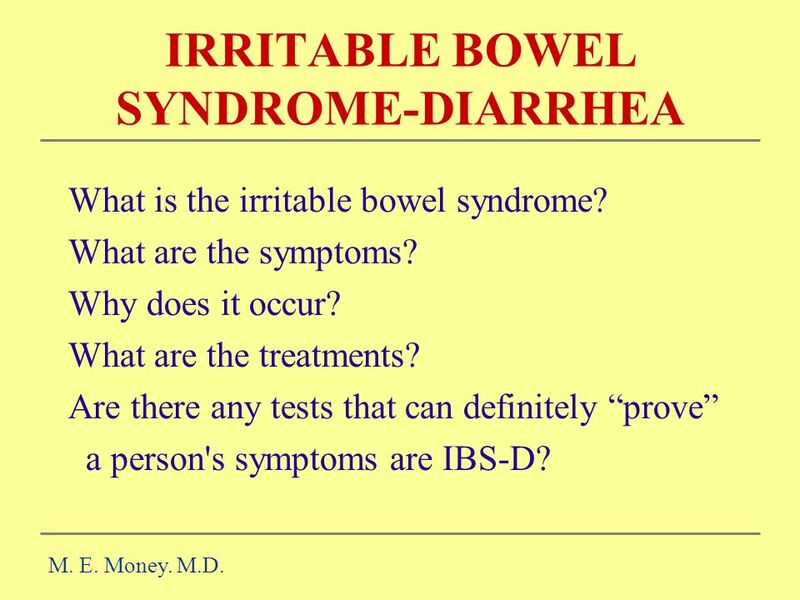 Inflammatory bowel disease/ Irritable bowel syndrome Dr. Syed Md. Basheeruddin Asdaq. Irritable Bowel Syndrome Sam Thomson 3 rd November 2010. Lower Gastrointestinal Tract KNH 411. © 2007 Thomson - Wadsworth.